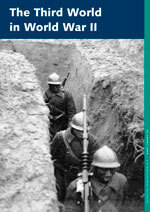 For more than 20 years a collective of free-lance scientists and journalists, based in Cologne, Germany, has been trying to overcome the eurocentric views on the history of World War II, supported by a group of researchers called “recherche international e.V.”. The first result of the research in 30 countries of Africa, Asia and Oceania over a whole decade was the publication of the book “Unsere Opfer zählen nicht – Die Dritte Welt im Zweiten Weltkrieg“ (“Our victims don’t count – The Third World in World War II”) in 2005. The book was selected by 24 critics in Germany as the most important non-fiction book of the month, when it came out and it got dozens of positive reviews underlining that it finally describes a so far almost forgotten chapter in the history books on WWII. After four hard cover editions the Federal Agency for Civic Education published two more paperback editions in 2015 and 2016. A third paperback edition followed in 2019. In 2008 a special educational edition for teachers and schoolkids was published in German, followed by a corrected and extended version in 2012. In 2009 an exhibition on the forgotten role of third world countries and people was presented for the first time in Berlin to tour afterwards in three different sizes (A0, A1 and A2) through more than 60 locations in Germany and Switzerland. It has been shown in historical museums, documentation centers for Nazi history, schools and universities and there are further bookings of this exhibition till the end of 2019. The exhibition is based on the book “Unsere Opfer zählen nicht”, which is therefor also used as a catalogue. (with an video-installation called “forgotten liberators”, which shows portraits from 200 men and women from third world countries, who fought against the facist powers and a world map of the colonial powers and the colonies at the beginning of WWII). In 2016 an English version of the exhibition has been produced (size A1). In January 2017 it was sent to South Africa for presentations in different cities over several years to premiere on February 28, 2017 in the Castle of Good Hope in Cape Town. It was shown in Cape Town till June, from July 2017 in Pretoria (Freedom Park), from January 2018 in Johannesburg (Holocaust & Genocide Centre) and from mid-2018 to mid-2019 in the Steve Biko Centre in King Williamstown. Presentations in further cities in South Africa might follow. (See: Places and dates of the exhibition in South Africa) recherche international hopes, that the exhibition will also tour to other anglophone countries in Africa and elsewhere. As for the books on the subject the reactions of visitors of the exhibition in Germany and in Switzerland also where overwhelmingly positive, as can be seen in the guest books from different cities. Mostly people are astonished, if not shooked about all the facts about the colonial historiy of WWII they never ever had heart about before, because there are not even mentioned in most history books. The only negative criticisme of the exhibition came from a few people, who can’t cope with the fact, that the exhibition also mentions collaborators of the facists in different continents. But in the more than 60 places, where the exhibition was shown so far, this critics were only a tiny minority. To accompy the exhibition this website was created, which provides background informations and recommondations (films, literature etc.) for all those interested in the subject and in presenting the exhibition. Most standard history books on World War II contain lists of casualties, which do not include those from Africa, Asia, Latin America and Oceania. Some statistics even fail to mention those millions of people who died in China during World War II. For more than 60 years the number of victims from the Third World that this war caused has nowhere been investigated systematically, the main reason being that most of the countries concerned were then still under European, American, or Japanese tutelage or control. Their casualties were lumped together with the victims of the colonial powers (and thus reduced significantly), or they were simply never counted. This is all the more appalling since World War II was fought in many Third World countries. Many historians at best mention black soldiers in World War II as exotic footnotes - be they "Senegalese bowmen" from West Africa or Australian Aborigines. Usually, veterans from the colonies are not invited to attend V-Day celebrations. And until today, they normally do not receive veterans' pensions, or if they do, they just make up a fraction of "white" soldiers' pensions. The French government still pays the equivalent of ten U.S. dollars per month to an ancien combatants from Dakar, Senegal, who had been fighting for four years in the French army in Europe. 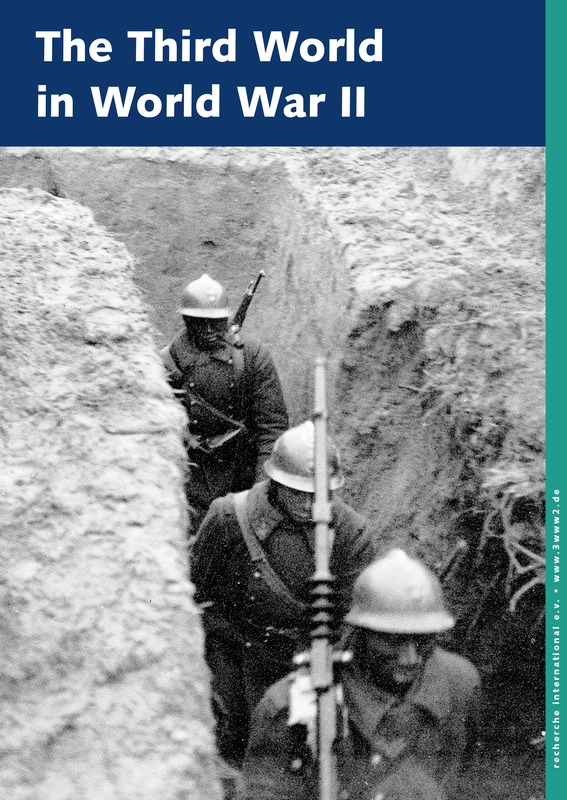 The book “Unsere Opfer zählen nicht” is the first publication, which gives an overview about the millions of people in the former colonies who served, suffered and died in World War Two. There are talks with a publishing house in Great Britain, which might be interested to publish an english edition of the book. In this site we provide some of the panels and some of the used photos of the exhibition for media coverage. These pictures are free to use as far as they are used in the context of media coverage on the projekt "The Third World in World War II". "The Third World in World War II" in South Africa in 2017.